Nicola Sturgeon has been accused of breaking her promise to the people of the north-east after she confirmed Scotland’s major trauma network will not be delivered for “at least” three years. The SNP leader gave a personal pledge to deliver a life-saving facility for the region just a day before the Holyrood elections in May. But yesterday the first minister confirmed it would take three years or more to deliver the national trauma network – despite the Scottish Government stating categorically in 2014 that the facilities would be “operational” by 2016. North-east Scottish Labour MSP Lewis Macdonald accused the Nationalist administration at Holyrood of betraying NHS patients and staff in the north-east – and his party has demanded an urgent parliamentary statement from Health Secretary Shona Robison. 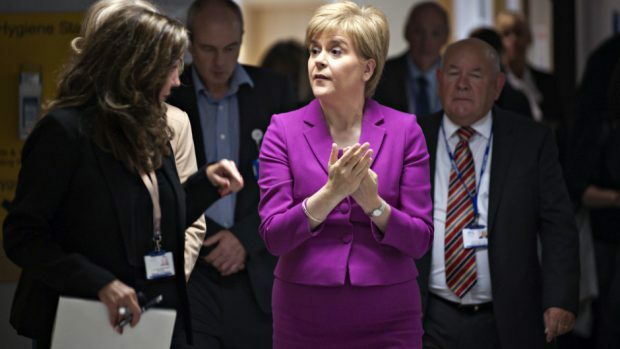 Speaking at Ninewells Hospital in Dundee, Ms Sturgeon said it was “extremely important” that the model for the trauma centre network was “right” – and announced an extra £5million to progress the plans. Ms Robison later said she expected the north-east centre – at Aberdeen Royal Infirmary – to “get up and running over the next one to two years”. Mr Macdonald branded Ms Sturgeon’s announcement “hugely disappointing” and said it would have a “damaging impact” on the morale of doctors and nursing staff. He added: “Nicola Sturgeon and Shona Robison have some serious questions to answer about their handling of this issue from start to finish. Aberdeenshire West MSP Alexander Burnett claimed north-east residents were now used to “headline grabbing pledges from the SNP which aren’t quite what they seem”. The Scottish Conservative member added: “Nicola Sturgeon made great play of this during the Holyrood election campaign last year when it became clear that a failure to deliver for Aberdeen would lose votes. “But now that the dust has settled, there appears to be no urgency whatsoever from the Scottish Government. In 2014, then-health secretary Alex Neil announced plans for four trauma centres in Aberdeen, Dundee, Glasgow and Edinburgh, with the Scottish Government stating at the time that they would be operational by 2016. Fears that Aberdeen would be cut out of the commitment appeared to have been allayed with an intervention by Ms Sturgeon, who gave the Press and Journal a personal pledge that the facilities would be delivered. Speaking yesterday, the first minister said: “We need to recognise that it is extremely important that we get the model right. “Given the scale and complexity of the changes required to deliver the network, we should need to recognise it will take at least three years to fully implement it. Ms Robison added: “Across the whole of Scotland it is going to take at least three years but actually the vast bulk of development in Dundee and Aberdeen will take place in the next year, year-and-a-half. “They are already getting on with the job and are well placed to start putting things in place. “We will see over the next one to two years Dundee and Aberdeen getting up and running.